Six months ago, Timothy was a heartbeat away from dying. Timothy Jones is back on his feet at Blanche Ely High School months after he got a heart transplant. NBC 6's Ari Odzer reports. Timothy Jones looks and feels like any other student at Blanche Ely High School in Pompano Beach. "I physically feel amazing, no struggle breathing, no struggle going to classes, no pain," Timothy said. He felt sluggish and nauseous at school one day last October. His mom took him to the hospital, and he was diagnosed with an enlarged, failing heart. Doctors told him he needed an emergency transplant. So now this high school sophomore was suddenly forced to confront mortality, being told his heart was working at five percent of a normal heart. "Shocked, surprised, confused, 'cause I've never heard those terms, I didn't know what that meant, I've never been to the doctor before," Timothy explained. Timothy was fortunate. A donor heart became available fairly quickly, and doctors at Joe DiMaggio Children's Hospital performed the transplant on December 1. Timothy came back to school exactly four months later, on April 1st. His friends thought it was an April Fool's Day stunt, but there was Timothy, with his trademark positive attitude and smile on his face. "Every day is a gift, even with, like, me getting a new heart, it's like, this is someone else's heart, someone sadly had to pass away for me to be basically reborn, and that's just like an amazing feeling," Timothy said. You could say Timothy is literally the poster child of heart transplants right now. His face is on billboards all over town. "I feel as if I cannot waste this because this could've went to anybody and it came to me," Timothy said. "He came back to school, I gave him the biggest hug ever," said Timothy's classmate, Sidney Henry. "He does what he has to get done and that inspires me to work harder." Another classmate and friend, Malik Session, echoed that thought. "It makes me happy and it does inspire, it makes me work hard in school," Malik said. One of Timothy's teachers, Andrea Johnson, said her class would regularly FaceTime with him while he was in the hospital for nearly two months. "The kids that know his story, they are inspired by him, how long he's been out, his energy, he's always a positive and he's always smiling," Johnson said. Let's face it, when kids have a classmate who just had a heart transplant, there are bound to be a ton of questions. "How do you feel, how was the experience, what happened, are you OK, does your heart hurt, can I see the scar?" Timothy said, recounting the litany of questions he's been hearing this week. He showed us the gash on his chest, a permanent reminder of where he was and where Timothy is going. He knows he has a lifetime of taking anti-rejection medicine ahead of him. He knows he has to eat a heart-healthy diet. He has a goal of losing 50 pounds. But Timothy says the new heart will be a permanent source of motivation. Part of getting back into the swing of things at school is getting back into marching band shape. 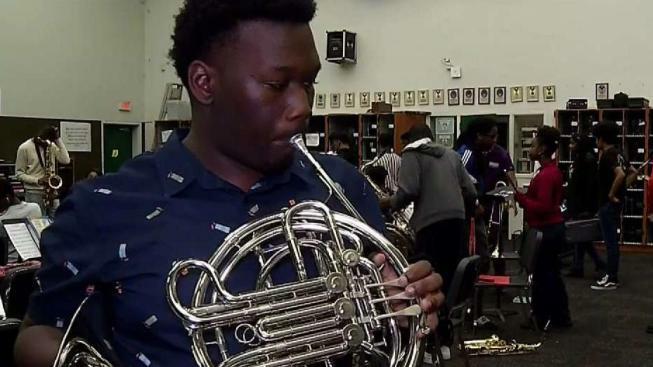 Timothy played french horn before the transplant, he's just now starting to play his instrument again, but he feels like he can conquer anything now, and he has a message for the organ donor's family. "Just to thank them for giving me a second chance at life and being able to come back to school and being a normal kid again," Timothy said. He's a normal kid with a new goal, inspired by his experiences as a patient: Timothy wants to become a transplant surgeon.